Having just move to a new high, the KLCI will be on holiday on Monday and therefore much depends on what the US market does on Monday's session. The tech sell off in big names like the FANGs on Friday's session in the US market will most likely hurt tech stocks in Malaysia and across the region. Which is why a bounce or recovery in US tech stocks on Monday's trading session will be crucial to tech stocks in Malaysia. Sometimes a holiday can be a bad thing for investors in Malaysia. If the US market crashes, you might be able to get out a bit earlier on Monday. But if the situations worsens in US on Monday, you can almost be certain that the KLCI will gap down on Tuesday dragging tons of stock lower before you can exit. On the other hand, a holiday can be a good thing if the US market crashes on Friday but quickly recover on Monday. You sit through the correction and rally intact, thanks to not being able to do anything on Monday because of the holiday. The Malaysian stock market has gone through a lot of growing pains. While the general direction is still up, the corrections and volatile movements in the markets are never easy. Despite being in a bull market, there are countless investors who still have their portfolio being beaten down. It takes a lot of skill to navigate the markets. If not every one would be a stock market wizard and retire from work for the rest of their life. Trading in and out of the market is never easy. If you do not have a system that will take you in and out of the market, you will most likely end up with a drawdown in your portfolio despite being in one of the biggest bull market that this generation has ever seen. Which is why I have written this article titled How To Avoid Huge Losses In Stocks And Maximize Profits Using One Simple Stock Market Trick. Let's go through some charts below and assess the situation in the Malaysian stock market. In the midst of chaos and sell off or volatility, it is always good to look at the longer term view. No matter what the short term charts show us, it is the longer term charts that will usually prevail in the end. Shorter term charts might hint of a possible reversal in the longer term charts. However, it is the longer term charts that often bring calm when the short term health of the market looks like it is in danger. 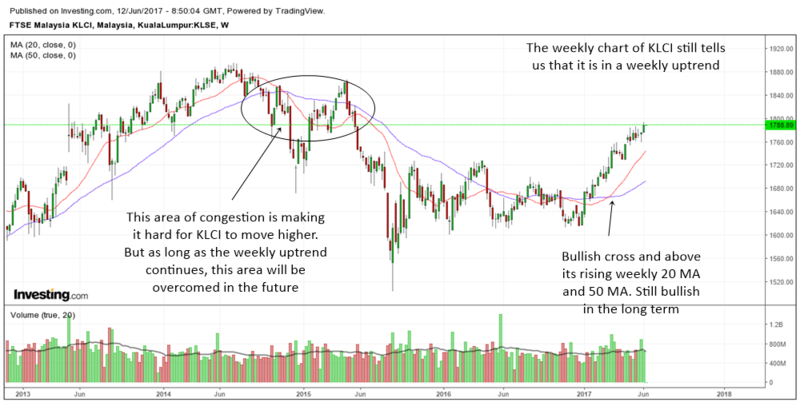 The weekly chart of KLCI above tells us a few things. The bull market is still alive but the KLCI has a lot of growing pains. Lots of congestion area resistance on the left will make it hard for it to have a smooth rise. Most probably KLCI will be a step by step rise in the daily charts. 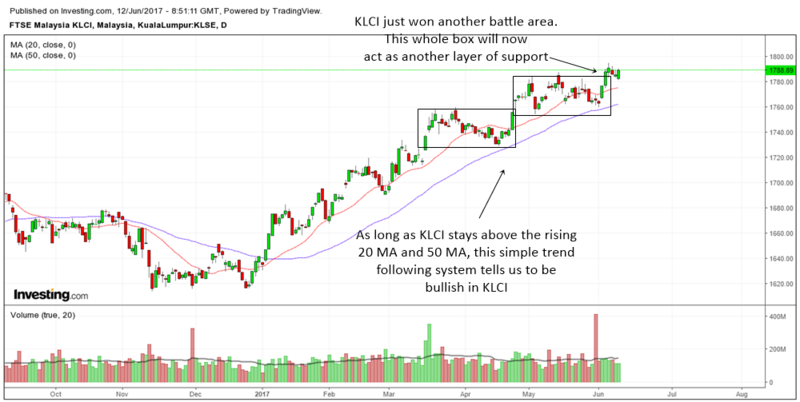 The daily charts show us that KLCI has just recently won another battle. By breaking above a box or congestion area, this index tells us it wants to win and it wants to go up. The boxes of congestion below will act as support. I like to keep things simple, so as long as the index is above its rising 20 MA and 50 MA, my bias is still bullish not bearish. 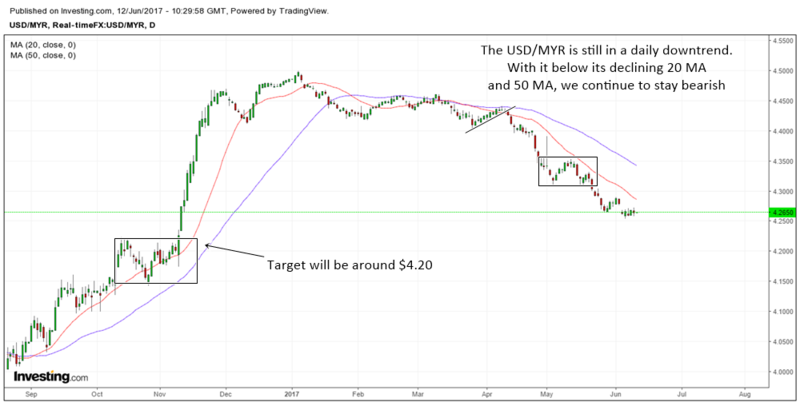 The USD/MYR which has been on a decline since the start of the year has continue to slide. As long as it is below its declining 20 MA and 50 MA, we should continue to be bearish. The next area where support is present is the $4.20 area. So that will be the target for the moment. The all rounded trader or investor will look at multiple time frames to have a laser like precision to his or her trades. I always believe a multi dimension trader will be better off than someone who only looks at the daily chart. What may seem to be a picture of volatility may be a picture of calm and orderly rise and fall in another time frame. And that provides the trader an opportunity to do wonders. The 60 min chart above shows how the KLCI index had a nice smooth run up recently. 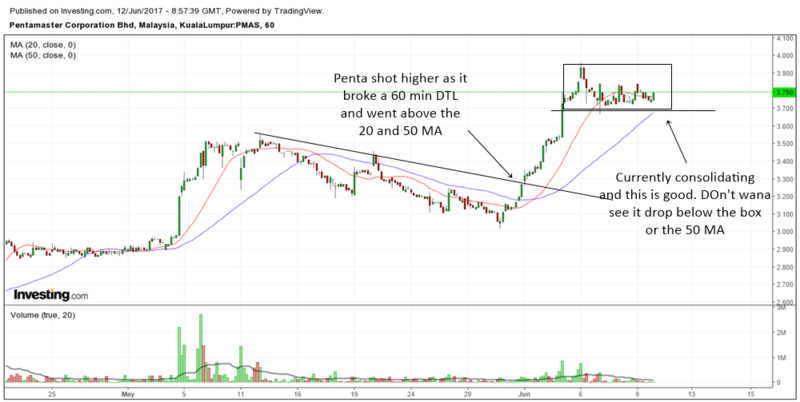 Once it broke the downtrendline and went above the 60 min 20 MA and 50 MA, it shot higher extremely fast for a few days. 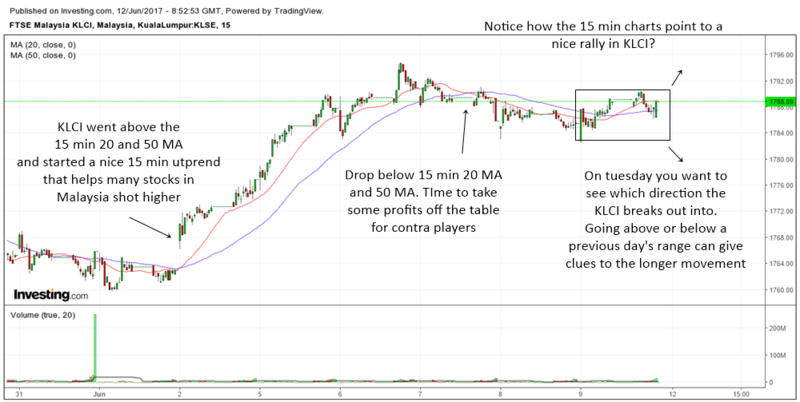 Currently it is quite overbought in the 60 min chart and some rest will be most welcome. The old highs in the 60 min chart should hold and we want to see the index stay above the area. While it is consolidating, I would not worry. I want to see it trade sideways but not go below the support area and the 60 min 50 MA. The more it consolidates the likelihood it will break higher in the near future increases. 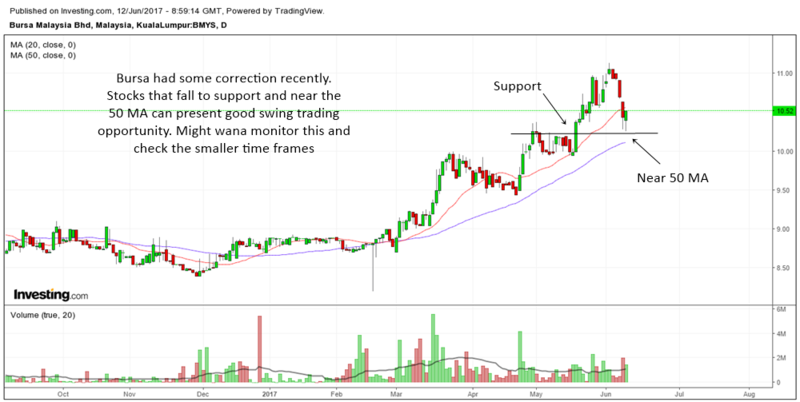 Looking at the 60 min charts, the correct area to buy was in early June and since the index is consolidating now, most traders will be better off sitting on their hands. If an index does not trend but move sideways, it can be quite difficult to make money in most stocks. 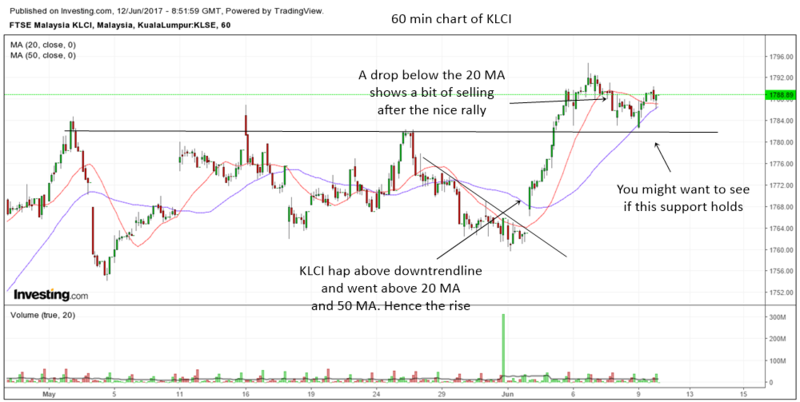 The 15 min chart of the KLCI above with its moving averages can offer the very short term trader opportunities to trade. At the moment the index is still trading above and below the 15 min MAs but come Tuesday it will be interesting to see which direction it breaks out into. Remember always that the breakout or breakdown of a previous day's trading range is a very significant event for short term traders. You can see this by looking at the index on June 2 when it broke above the previous trading day's range. 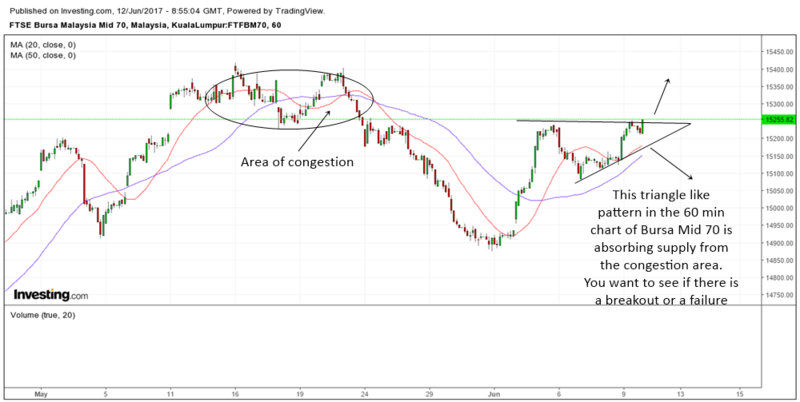 It then went higher for a few days until the index broke below a previous day's trading range on the 8th of June and ushered in some sideways movement in the index. Zooming into the smaller time frames in different sector and sub indexes can often give us a hint of when to buy and when not to buy stocks. 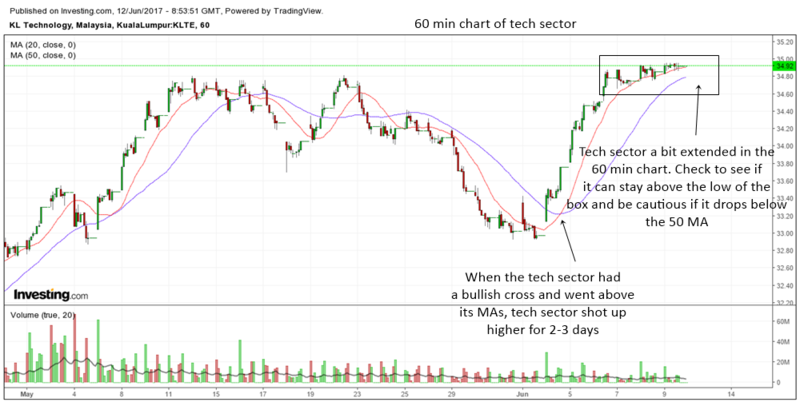 In the chart of the Malaysian tech sector, we can see how the tech sector offered some nice trading opportunity in early June for short term traders. You buy tech stocks and then sell it a few days later. Currently the stock chart does not show any weaknesses in tech stocks yet. But the big sell off in tech stocks in US might make the index gap down on Tuesday. Which is where the index will be below its 60 min 20 and 50 MA and which is where it will not be very good for traders to touch tech stocks for short term trading. The FTSE Bursa Mid 70 is forming an interesting picture now. It is forming some kind of an ascending triangle because it is trying to absorb supply from the congestion area on the left. Ascending triangles can work and may fail. We want to see carefully if it can break higher. A failure to do so and a fall below the uptrendline in the triangle may send stocks in the sub index lower. Airasia was one of the stocks that I highlighted in Malaysian Stocks To Take Note Of In May, June 2017. I try to update it with new stocks if I can but lack of time made me unable to do so. But instead of making a new page, I will now just input some stocks in June into that page. The recent one I added was Bursa for a possible swing trade at 50 MA and support. 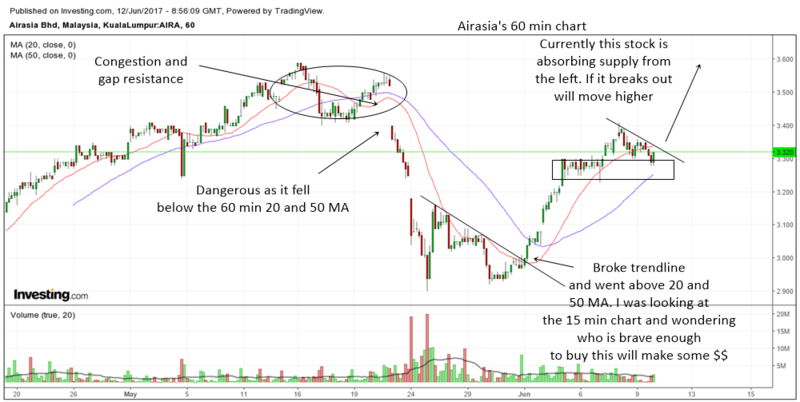 Airasia was falling to an area of long term support and I was wondering who would be brave to buy it. Normally stocks like this will sell off because of some earnings or news and then when it stabilizes and go above their 60 min 20 Ma and 50 MAs they tend to rise furiously. The stock has recovered most of the losses it had. We want to see it stay above the congestion area (box) as it tries to absorb supply from the left. The gap resistance will take some time to overcome but I think if it breaks above the downtrendline I draw and move higher, it may well continue to move even higher and surprise many people. We do not want to see it drop below the box and the rising 60 min 50 MA. Long term wise I still believe the Malaysian stock market will move higher. Nothing to worry at the moment as long as the uptrend in the weekly chart and daily chart is intact. For the best trading opportunities, you will still need to zoom into the individual sectors and stocks to find good trading candidates. Remember to only choose the best setups and not just any setups. Try to find stocks with good risk rewards as well. Trading is a journey, a marathon and not a 100 m dash.